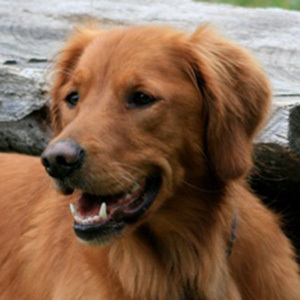 Cedar is a 53lb Golden Retriever who was born in 2005. Cedar was adopted from a local Golden Retriever rescue group back when she was only 8 weeks of age. Barb says from the very beginning Cedar acted as if she wanted a job to do, so working to become part of a North Star Therapy Animals therapy team wasn’t too difficult for her. Since 2010, Cedar has been prancing into libraries (according to Barb) like she owns them, and she very much loves having the kids read to her…not to mention the treat she gets from them to enjoy when the book is finished! During her down time, Cedar loves to wrestle with her brother Rudy, cool off from summer temperatures in the wading pool, carry around two tennis balls at once, and play fetch. While most dogs who love tummy rubs roll over on their backs to be petted, Cedar prefers to sit up and relish in a good tummy rub!